Boil 1-1/2 cups of water in a small pot over medium-high heat. Mix the chocolate chips with 1 teaspoon ground cinnamon in a heat-resistant container. Add the milk, stirring until you get a well-blended mixture. Next, put the container with the chocolate in the pot with boiling water until the chocolate is melted from the water bath. Stir constantly until the chocolate is completely melted. Remove from the fire and add almond extract. Put the chocolate in the refrigerator for 1 to 2 hours or until the chocolate has set but is still soft. While the chocolate is in the refrigerator, mix the cocoa powder with the remaining ground cinnamon. Remove the chocolate from the refrigerator and form 1” balls. Roll the chocolate balls over the cocoa powder mix, making sure that they are completely covered in cocoa so they don’t stick to each other. 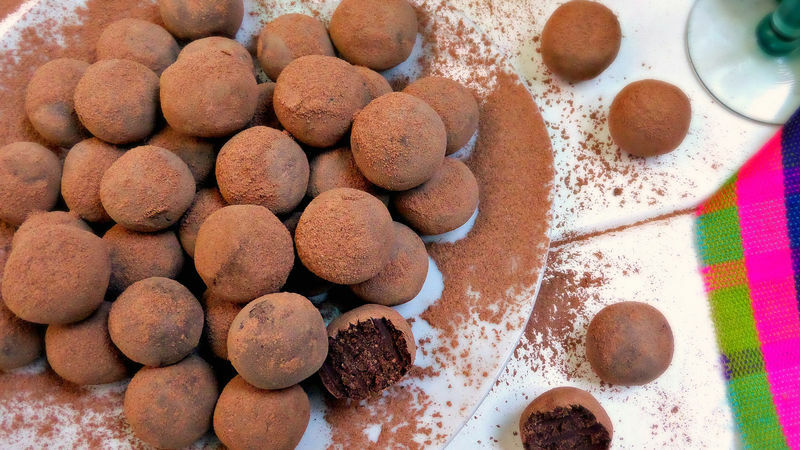 Place the truffles in the refrigerator for at least 1 hour until the chocolate hardens. Keep the chocolate truffles in an airtight container or in clear bags if you’re giving them as gifts. Add 1/2 cup almond or nuts finely chopped to the mix of melted chocolate and almond extract.